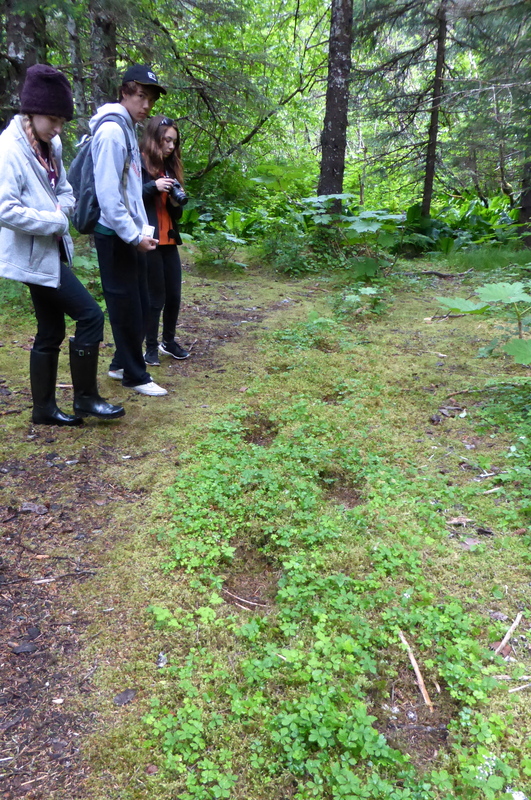 Having explored the beach, the group now turned their attention to a walk that followed Fox Creek into the depths of the conifer forest. Here, they hoped to find plants that thrive in the under story in the moist, mossy areas alongside streams. This too, is the favourite haunt of grizzly bears, especially at the time of the salmon run in these creeks. As they entered the forest, the group soon found evidence of bears in the area. Apparently, bears choose to regularly walk in these old bear prints. No-one really knows why. But, the size of the prints and the spaces between them show just how big these animals are! Hopefully none were out and about in the forest! But the thought always added an edge of excitement to forest walks in the Tongass. So, time out for bear drill! Stay together. Talk while you walk. Bears don’t like to be surprised. And if you do see a bear? The first rule is simple, but it may be difficult; DO NOT RUN! A bear can reach speeds of 60km/h and you can’t. Stay still, slowly raise your arms to make yourself look taller, and slowly retreat. With luck the bear is more interested in berries than in you. Now, what about those stream side plants? Almost lost in the lush green undergrowth of the forest, the Slender Rein Orchid; Platanthera stricta, can easily be overlooked. It looks so elegant against the rough bark of a conifer. Also in this moist, moss covered soil were several of the parasitic Northern Groundcone, Boschniakia rossica, which David had previously found growing under Alders. Here they were gaining their nutrients from Sitka Spruce. One plant to be especially wary of is the well named Devil’s Club; Oplopanax horridus. Those thorns are horrid; the species name says it all! Despite that, this plant has been used by the native peoples for centuries for its medicinal properties. The roots and inner bark have been used to treat ailments such as arthritis and diabetes, ulcers and stomach upsets. Just getting to the inner bark must have been a daunting process. The stems were also used as fish lures. Some groups believed that charcoal made from burning the stems would protect the wearer from evil powers if used as face paint for ceremonial occasions. The pyramidal terminal head of buds that forms the “Devil’s Club’ becomes a rather attractive head of white flowers. These are followed by bright red berries which aren’t edible for humans but are a favourite food for bears…. and this forest is known to be home to many bears. Making a showy statement in the green of the forest was this bright and cheerful, yellow daisy, Mountain Arnica; Arnica latifolia. How can anyone resist the temptation to take a photo of such a flower? A closer look, shows many tiny flowers bursting out from buds which are clustered on the central disc. Those yellow bracts are strikingly veined. So intricate… and yet so many people often pass them by as ‘just a daisy’! A tree, fallen across the creek, its trunk now covered in moss, was surrounded by lush growth. When a tree falls, it opens up the canopy allowing light into the understory and that gives a chance for the forest floor plants to grow stronger. A fairly common plant found growing in moss covered, moist soils alongside a stream is the delightful Orthilia secunda, an evergreen perennial with deeply veined elliptical leaves. These leaves contain an acid that has been used very effectively, we were told, to treat skin sores. The white to pale green, nodding bell-shaped flowers are all directed to one side of the plant. This has given the plant its common name, One-sided Wintergreen. This forest was the most dense and lush that David had experienced on the trip. 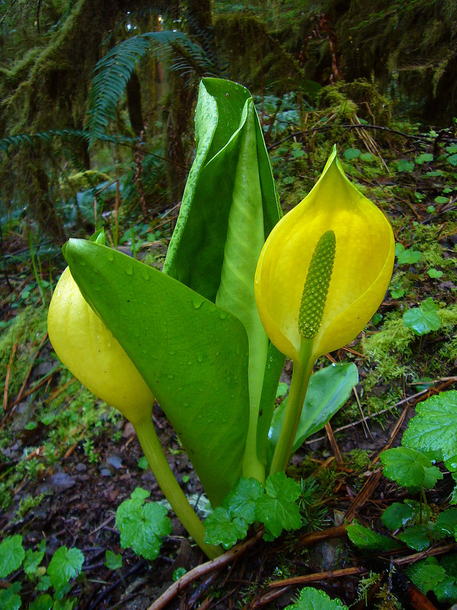 As usual in the wet areas of these forests, Lysichiton americanum, Skunk Cabbage, was in evidence. It also has the name of Swamp Lantern. Why? A search on images on the internet supplied the answer! Lovely, isn’t it? A close up of the flower of the carnivorous plant Common Butterwort, Pinguicula vulgaris. This photo clearly shows the 2-lobed upper lip and the 3-lobed lower lip with a white ‘path’ of spots in the throat to lead a pollinator into the flower. It grows in damp environs such as bogs and swamps in places that have cold winters; in the northern parts of Russia, Canada and northern parts of the United States including in Alaska. At the beginning of autumn the plant forms winter buds so that it can survive being frozen. One of my favourite wild flowers is Aquilegia formosa or Red Columbine. The common name apparently comes from the Latin, columbina, meaning ‘dove like’. The petals and spurs supposedly represent five doves gathered around a feeding spot. That thought had never occurred to me! The spurs attract sphinx moths, the plant’s main pollinators. Here, crossing the creek, was the most likely spot to encounter a bear. But not on this walk. Tiarella trifoliata is a small perennial herb. The tall leafless, panicle of bell-shaped, white flowers rises above the basal leaves which are trifoliate. It always grows on a north facing slope in the understory. Common names are many: Three-leaf Foam Flower, Lace Flower, False Mitrewort, Coolwort or Sugar Scoop; take your pick. The last name needs a bit of imagination! This is another example of the need to use scientific names. Moist, mossy areas; toadstools and fungi are a common find. The Shy Maiden; Moneses uniflora seemed to be present on every walk. One of the many varieties of moss; each important to the ecology of the forest. The creek path lead the group back to the beach. or when the spring thaw brings water down from the mountains. ‘Sea Lion” was almost lost in the soft ‘mizzle’ that had begun to fall. Alongside the creek, after leaving the cover of the forest, Heracleum lanatum, or Cow Parsley, grew amongst the grasses. This large perennial plant was used as a green vegetable by many native peoples. However, because handling Heracleum stems can cause severe skin problems and blisters, only the very young stalks and leaf stems were eaten and only after they had been peeled. They were also occasionally boiled. Rhinanthus minor or Rattlebox was also growing amongst the grasses along the creek edge but outside of the fringes of the forest. 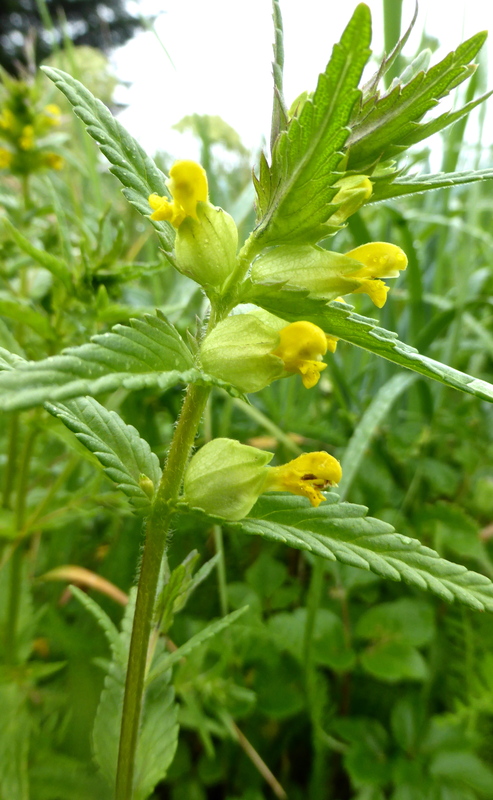 The yellow flowers, protected by green bracts, have two lips; the upper one being hooded. This plant’s scientific name, Rhinanthus, comes from the Greek and refers to the unusual shape of the flower; rhin meaning snout and anthos meaning flower. The common name of Rattlebox refers to the noise that the numerous, winged seeds make as they rattle around in the seed box before they are expelled to the air. A delightful, small, ground hugging plant, Potentilla anserina ssp. pacifica, or Silverweed, grew in soft, wet, sandy spots beside the stream. This is the only one of the cinquefoils which has runners and single flowers borne on leafless flowering stalks. The roots of this plant are of two types; long fleshy taproots holding them firmly in the ground, and short curly roots near the surface. Although bitter to the taste, the roots were boiled as a vegetable. As the ‘mizzle’ turned to drizzled and the clouds came down ever lower, it was time to return to the ship, dry out, enjoy some lunch and share stories of the day with new found friends. A quick look outside confirmed the decision to stay on board for the afternoon! and a briefing about Glacier Bay National Park, our next destination. More of that very special place anon.